There are, in my experience, few metrics that cannot be gamed. Over the years of my career I have seen many attempts to measure employee productivity and value via metrics, and this often leads to people simply optimizing their behavior to these metrics, even if that does not end up being the best thing for the organization overall. Tell a dev you’re evaluating them based how many lines of code they produce and you get lots of lines of code. Tell a dev manager they’re being rated on how many defects are found in the code their group produces and they’ll beat on testing until they stop writing bugs. Tell the dev manager instead that the measure is defects found after shipping and they’ll make testing stay late and come in on weekends and argue that anything found is “as designed” or otherwise expected behavior. Basically any organization needs to consider these things lest they find themselves encouraging behavior that is contrary to the good of the business. However, used correctly, a metrics can promote desired behavior. Reactivity and all that is a thing. All of which brings me to what I tend to think of as the “PAP Link Economy” in EVE Online. PAP links, short for “participation links” have been a part of the Imperium for quite a while now. They are actually a contribution to the coalition from my own alliance, TNT. So you’re welcome for that I guess. The idea behind PAP links are simple enough; the alliance and coalition wanted to know who is going on fleets. That sort of thing is easy enough to keep track of casually if you have a hundred or so pilots. You look at a few kill mails to see who was shooting things, keep a list of your usual logi, and you’re probably fine. But when you have thousands over all time zones, knowing who is stepping up and who is shirking is more difficult. There was a need to count noses and see. This was back before the changes to the shape of null sec. 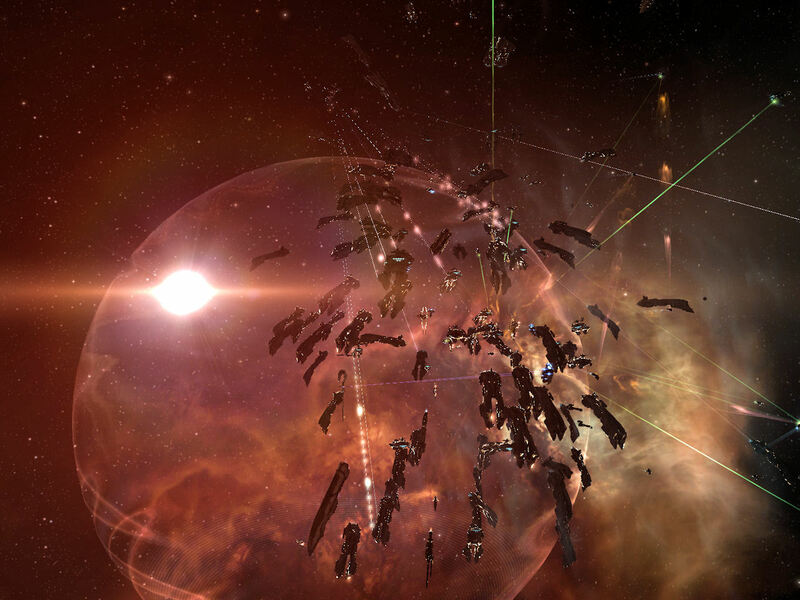 Dominion sov was still the rule, there were good and bad systems in null, and a lot of null sec organizations were still PvP purists or elitists, depending on how you looked at it. When I joined TNT if was made clear that we were a PvP alliance and I was expected to go on fleets and shoot hostiles. Ratting and mining were for times when there were no fleets going out. Anyway, somewhere along the line, after the Fountain War if I recall right, the PAP link scheme showed up. At the time it was an actual URL put into fleet chat that fleet members were expected to click on. It would bring up the in-game browser and feed in the basic information about you, your ship, and your current location. There were, of course, problems with this. You had to be paying attention to fleet chat to see the link. People asking for a repost of the link were a constant thing. Some people would covo the link to pals so they could get credit on the fleet without showing up. Once in a while an FC or other fleet VIP would make the PAP link and accidentally post it in the wrong channel. Nothing like a PAP link posted in local to get a bunch of randos on the list. And if Russians were inexplicably showing up in your fleet, they would click on the link just because it was a link. There was a problem for a while where the links wouldn’t register if you were docked in a station, so you had to make sure and undock to click on it if you got the link at the very end of a fleet. And, while the most of the then CFC were using the same system, RAZOR had to be different and developed their own version on the links. If RAZOR people were in the fleet the FC would have to get somebody to make them one of their PAP links in addition to the regular one, and you were only supposed to click on the right one. Later, after the Casino War, when RAZOR was gone and the in-game browser was removed, a new version was setup that let/made the FC capture the list of fleet members and paste them into the system to “capture” who was along on the fleet. This made PAPs a little more nebulous in that pilots did not have to take an action to get counted, but just had to trust that the FC did the thing and pressed the right button. Corps also use it for various things. Most have a monthly minimum you need to hit. I think in KarmaFleet you need just one per month, but they only check every quarter, so you have time get yours. My own corp wanted us to get two or four per month at one point, but that seems to have eased up. Some corps pay a bounty for each PAP link you collect, sometimes adding an additional bonus if you fly a fleet critical role like logi or boosts. Of course, some people love this and others hate it. Anytime leadership seems to be checking up on people it is going to feel like a lack of trust to somebody. I kind of like them. I tend to be so quiet on coms… coms discipline was something instilled on me many years ago… so I often wonder if anybody notices when I show up aside from the PAP credit. And I can see the need in such a big organization. You have to make the spies that have infiltrated carry some of the burden. You can see why I think of it as the PAP economy. It is a currency of sort, a credit for your participation, a rent payment towards your continued tenure in the organization. It is something both tracking you and which can be said to have value, sometimes quite literally if you’re in a corp that pays a PAP bonus. As with anything of value PAPs can be a contentious. Some people don’t care about them, or claim they don’t, others obsess a bit about them. On fleet ops there is always somebody asking about when a PAP will be captured and usually somebody ready to tell them to shut up. People get angry when somebody even mentions a PAP on fleet coms. Sometimes it is the FC, as they get tired of hearing about it. But they also want credit for running fleets. And occasionally an FC will feel generous and give us an extra PAP. Asher gave us ten for the battle at F4R2-Q, then regretted it. It was a pain to do a set a precedent. Now you’re better off not mentioning PAPs in his fleets. And so it goes. In an attempt to add some accountability to the membership, the leaders of the coalition have incentivized making sure you get a PAP for every fleet. Give value to a thing and people will get all weird about it. This entry was posted in entertainment, EVE Online, Null Sec and tagged CFC, Imperium, Organization Behavior on January 18, 2019 by Wilhelm Arcturus. Is that not how internet points work?